Easy to grow, and a very useful vegetable, Okra grows well in warm climates and can be grown from seed. Widely used in the Southern USA, you can grow it in containers if required. Although growing Okra is fairly easy, we do not see it very often. The long green fingers of Okra are not as familiar in Australian gardens as in some other countries, however it is a vegetable increasing grown by market gardeners in northern Australia. It is the young fruits that are used in many cuisines, especially Middle Eastern and Mediterranean areas. Widely used to thicken stews, it can also be used in stir fries. In Australia Okra is most commonly used soups and stews. Common names include Gumbo, Ladys Fingers and Bhindi, although in Australia it is simply Okra. 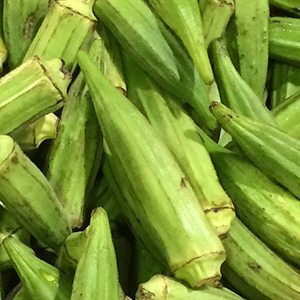 You do need warmth and humidity to grow Okra successfully. In cool to temperate areas int can be sown in late spring to early summer, in sub tropical areas the growing season is much longer. Originating from South Africa okra prefers a warm climate and a humus rich soil. Best grown from seeds which are usually soaked in water overnight before planting to improve germination. Sow the seeds directly in warmer climates, or sow indoors in trays in cooler areas. Okra needs to be kept warm and moist although with good drainage. Okra plants take only a month or so to produce fruit in good conditions. Plants should be spaced at around, .6 metre to 1 metre apart. The fruit is best picked a few weeks after flowering, if left in the plant for to long the fruits become stringy and indigestible. The fruit can be frozen to use through the winter if required.